I have always seen these Choxie chocolate bars with festive packaging at Target stores all over the country. I have never bought one, thinking it is too expensive for my taste. It just looked too good to be true. Well, I was seriously wrong! I recently bought one and tried it. My gosh, so flavorful and decadent! I had to go back and buy 3 more varieties: the coffee, dark chocolate and key lime. I was also a huge fan of choxie, the mint truffle bar and the truffle boxes were my favorites, but they were all fantastic! I was hoping to buy some as gifts, but I have been unable to find them any where for the last year or so? does anyone know where I can find them anymore? I just tried the rasberry lemon biscotti dark chocolate bar...omg is there something to describe more than heaven?? 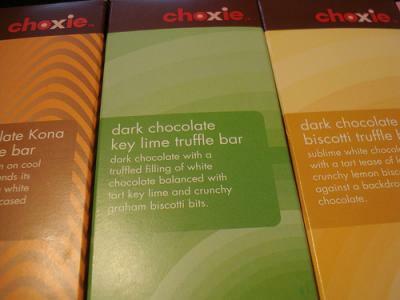 It's my fav chocolate bar of all time...I can't wait to try the other choxie flavors. I'm sitting here nibbling on the dark chocolate coconut truffle bar that a neighbor gave me and it's mmmmmmm mmmmmmm good. Two of my favorite flavors - dark chocolate and coconut. It is creamy and not too sweet. I will definitely try the other flavors when I'm in Target again. Thanks Amy! I have got to try these soon. I wonder if they will have them at Target here in Australia? If not I hope they carry them year round so I can get some the next time I'm back in the US. I was first tempted by the concept of the Dark Chocolate and Key Lime, but now that you mentioned the Raspberry Lemon Biscotti... ugh! How will I choose? Guess I'll have to try both! :) Poor me. Thanks again for wonderful contribution. I hope you will continue to share your favorite chocolate photos and treats.